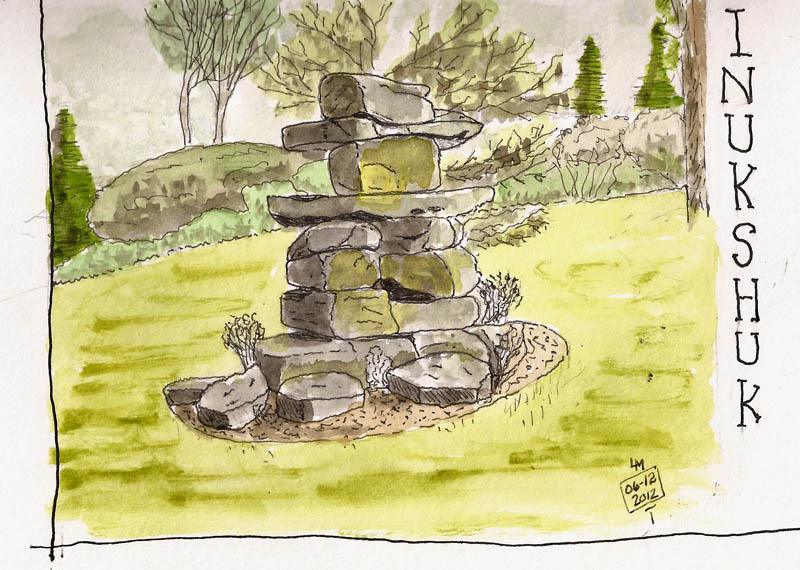 Canson XL Multi-media (7×10), Wing Sung 8008, DeAtramentis Document brn/blk, DS watercolors. 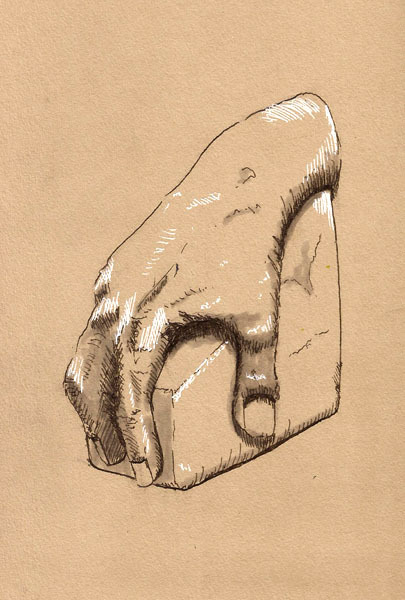 My hands were working Friday night so I decided to sketch a small wood carving we have. The actual carving is of a grumpy old man like myself but decided to draw him younger. In the end, it made me smile. I was sketching while watching the Blue Jays so I was drawing in a Canson XL multimedia book that I use for scribbling during TV time. This is not watercolor paper but if you go easy on the water, you can add some color. 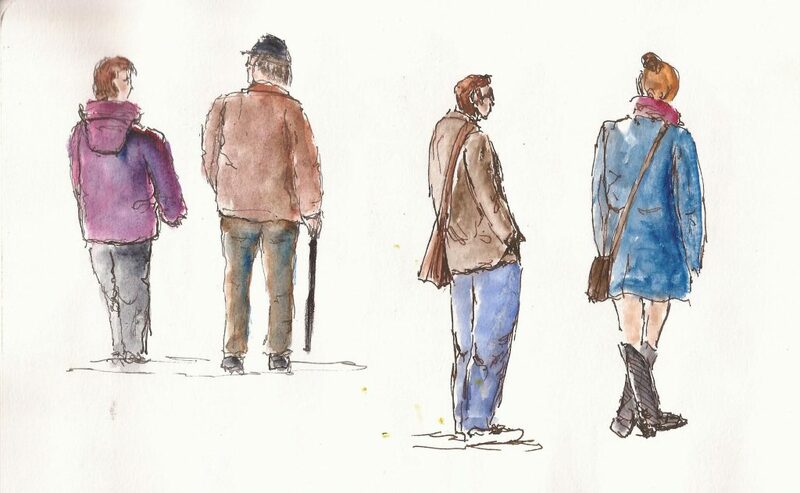 I used a Portable Painter filled with Daniel Smith watercolors that I keep available for these purposes. Yvan and Claudette came to visit this week and we spent the afternoon sketching my stuff. I’ve got a bunch of stuff, mostly obtained at flea markets for purposes of drawing and we put some of it to good use. As is too often the case, my hand was hurting me but we nevertheless had a great day. Yvan drew the front of a plaster rabbit so I drew the back and found it hard to make the foreshortened ears sufficient to give the rabbit a real rabbit look. Some views are better than others I suppose. Claudette did a really great drawing of a large Japanese woman’s head and it turned out great. We took a break, had coffee and the obligatory talk of drawing and watercolors. We decided to draw something else. I have two really nice Japanese figures that I’ve drawn several times and Yvan chose to draw the male figure so I grabbed the female (that didn’t come out right). 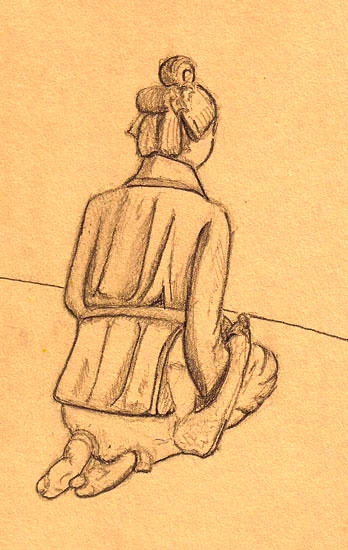 I’d never drawn her from behind so I decided to do so, drawing in pencil in a Stillman & Birn Nova. In the end I wish I’d used ink but this is the result. I was at our civilisation museum the other day and my joints were bothering me. 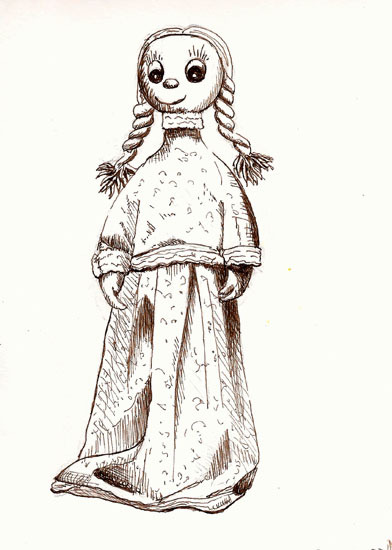 It was hard to draw and, even more, it was hard to concentrate because of the pain. 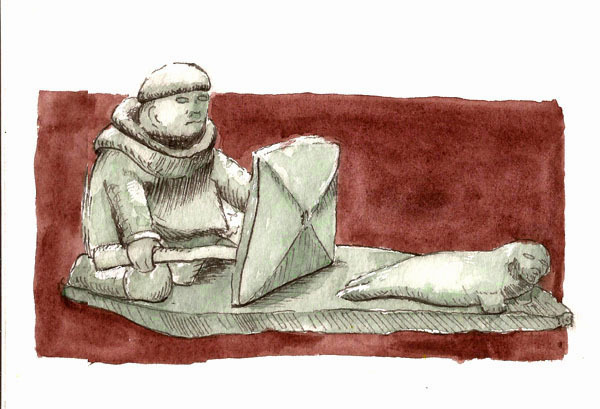 But I sat, stared at, and drew an Inuit stone carving of an Inuit stalking a seal. I loved how a complete scene was captured in the rock. 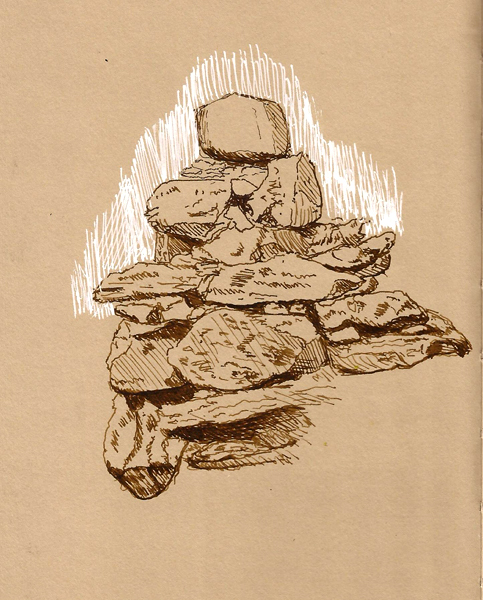 Here in Quebec City we’re still waiting for the opportunity to get out of our igloos so we can sketch outside. 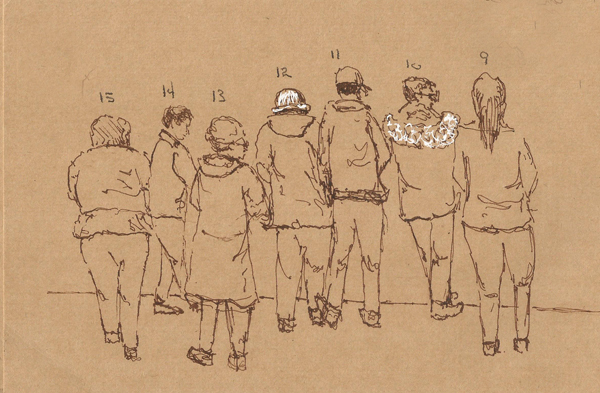 Until the snow starts melting, however, we get together at someone’s house and sketch. 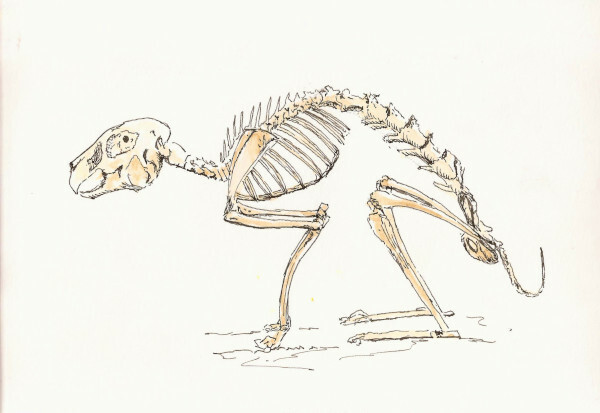 A favorite in that regard is Yvan’s place because he has a great studio that’s filled with an artist’s version of a cabinet of curiosities so there’s lots of stuff to draw. 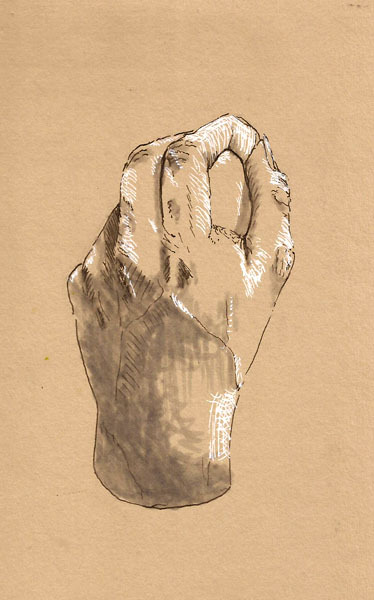 When several of us gathered there I chose to draw plaster casts of hands. I had a lot of fun with these but I made the mistake of using a water-based felt pen to shade them. I know lots of people love felt markers but I can’t understand why. Whenever I use one the results are streaky and splotchy. 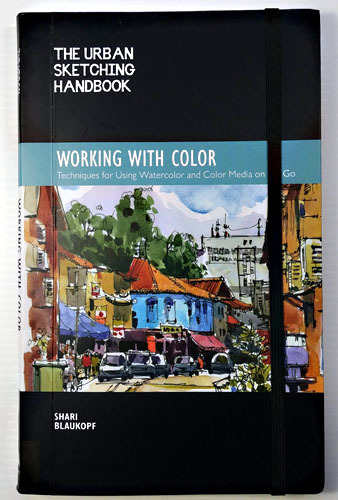 If you’re a sketcher who uses watercolors, you probably also know that it would be great if you could spend time talking with Shari and asking her questions about watercolor. Most don’t get that opportunity, so she’s written Working with Color and owning a copy is the next best thing (grin). I binge-read my copy, which means it took me three days to get through it. 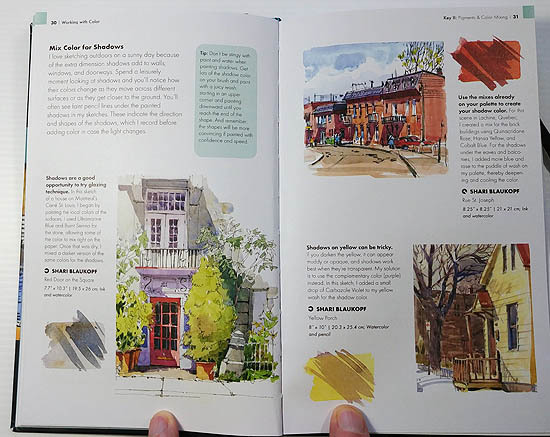 No, I don’t read that slowly but Shari’s book is written, as are the other Urban Sketching Handbooks, as a bunch of small sections full of guidance and tips. It seemed that each one had me doodling and pushing paint around, trying out the things she talks about. Not only did I have a ball, I learned a lot. 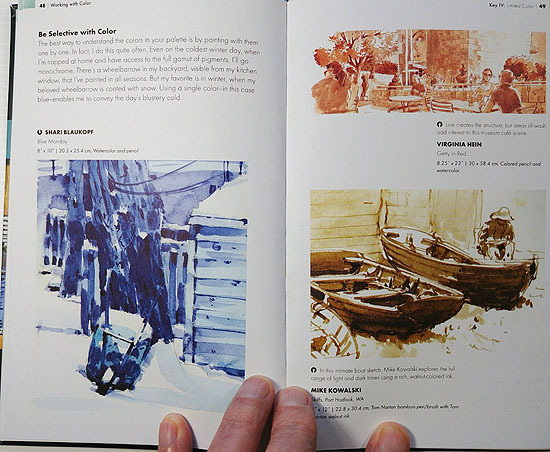 Like most books on watercolor, the early pages cover materials. 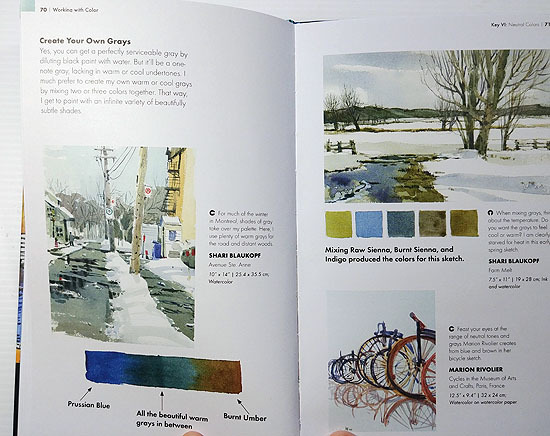 This book emphasizes materials that facilitate sketching on location. I confess that I rarely get anything from such sections but it was interesting to see Shari’s palette choices. Very quickly, however, Shari moves on to color mixing and color and value in general. Subjects covered include: mixing darks, mixing greens, shadow colors and a discussion of values. 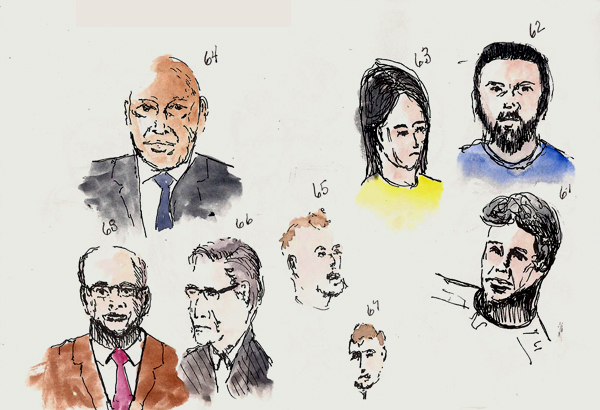 Each of these subjects are supported by sketches that illustrate each subject. 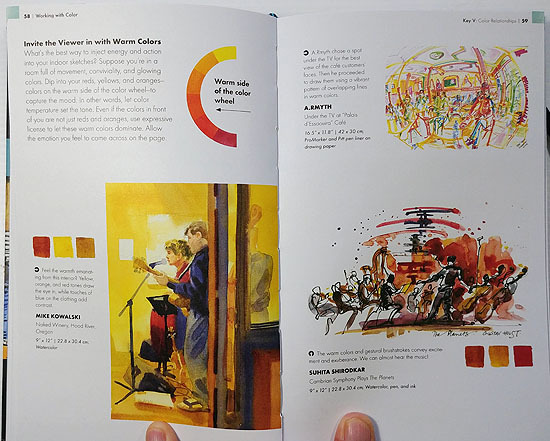 There is a section on limiting your color(s), from selectively choosing a single color to discussions of the use of a limited palette. This later subject was time-consuming for me as Shari suggests several triads and, of course, I had to try them all (grin). 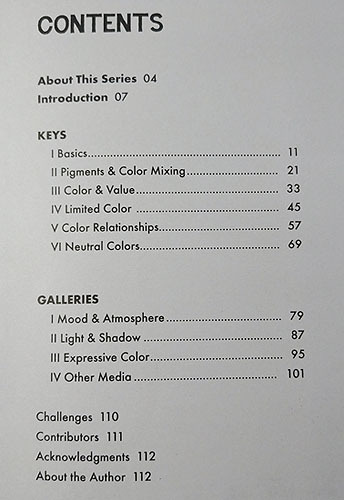 There are a couple different sections on using color to express mood and atmosphere and I have to read them again as there is much to think about in these sections. There’s also a large section on mixing and using neutrals. This is an area that is important to the watercolorist, but an area where I understand very little. Mixed into this section is the notion of using warm and cool grays in an urban setting and it all seems like its the core of what I should know. Wish I did. This book is helping quite a bit. I need to do a bunch more doodles and neutrals mixing though. I do think that if you just read all the tips and look at the pictures, very little will change in your art. This is stuff that you have to do if you’re going to begin to incorporate the ideas and methods into your art. But heck, that’s the fun part and I can’t recommend Working with Color enough to anyone wanting to better understand how watercolors work and how they can be used in a sketching environment. Truth is, they were in my garbage can, where most of my “let’s try this” doodles end up. I dug through the can and found a couple of the sheets with rabbits on them and, with some embarrassment, I’ll show them to you. Laugh if you like. I don’t mind. These sheets are cheap card stock from Staples and so they don’t take watercolor well at all but I have such sheets sitting next to my computer and I’m always doodling something. 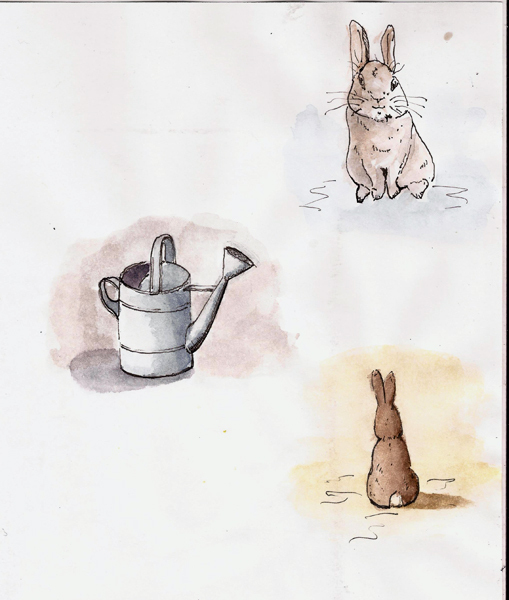 Some feeble attempts at drawing stuff from Beatrix Potter’s Peter Rabbit book. 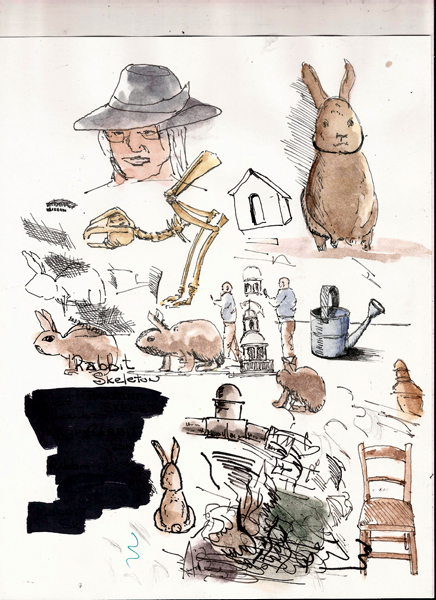 This hodge-podge of scribbles is typical of my doodle sheets. 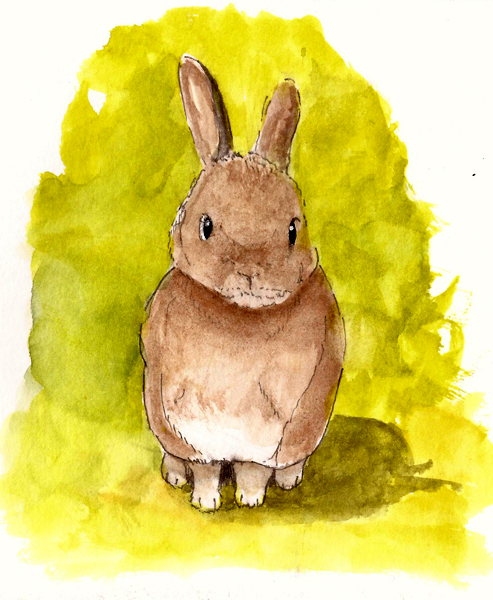 This one contains some feeble attempts at rabbits. 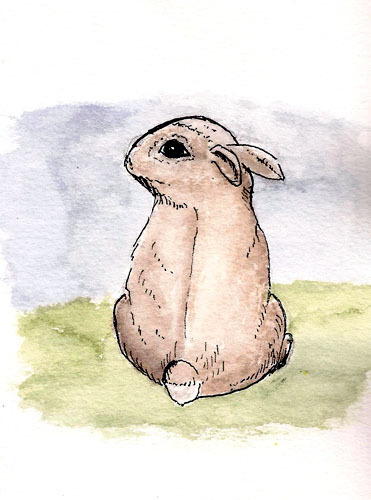 I thought I should include a serious, though not entirely successful, attempt at a rabbit just to redeem myself somewhat. I think she’s cute.